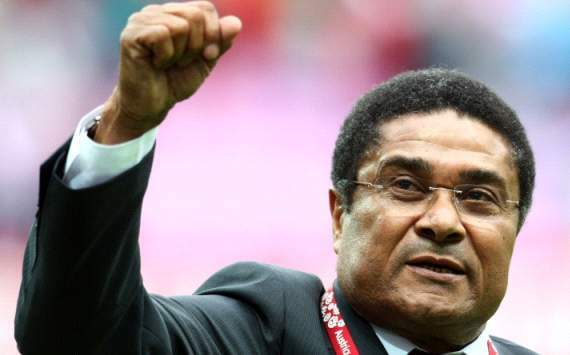 Portugal football legend Eusebio, who was top scorer at the 1966 World Cup, has died at the age of 71. Born in Mozambique in 1942 when it was still a Portuguese colony, Eusebio da Silva Ferreira went on to play 64 times for Portugal, scoring 41 goals. The Benfica striker’s nine goals at the 1966 World Cup in England included four against North Korea. Widely considered one of the best players of all-time, he scored 733 times in 745 professional matches. He had been admitted to hospital several times over the past year for the treatment of heart and respiratory problems. Famed for his blistering acceleration and dazzling dribbling skills, Eusebio was named European Footballer of the Year in 1965. He won the European Cup with Benfica in 1962 and was in the side that lost to Manchester United in the 1968 Wembley final. He won 10 league championships and five Portuguese cups in his 15 years at the club and was Portugal’s top league scorer seven times. Current Portugal captain Cristiano Ronaldo was among those to pay tribute. “Always eternal, Eusebio, rest in peace,” the Real Madrid and former Manchester United striker wrote on Twitter alongside a picture of both men together. Eusebio’s goals in the 1966 World Cup helped his country to third place, after they were beaten by eventual winners England in the semi-finals. Portugal won all of their group games as title holders Brazil were eliminated in the first round, and Eusebio starred in a dramatic 5-3 win over North Korea in the quarter-finals, with his four goals helping his side come back from 3-0 down. Portugal went on to lose 2-1 in the last four to England, with Eusebio in tears as he left the pitch at the end of the game. But he had captured the hearts of the British public and his figure was soon added to Madame Tussaud’s waxwork collection. Eusebio continued to play at the highest level until 1974, but knee problems had already begun to slow him down. In 1975, he moved to the North American Soccer League and then returned to Portugal in 1976-77 to play for SC Beira Mar, before further spells in the USA and Mexico.